Glen Macnow , sports talk announcer of 610 WIP and author of a new book, The Great Sports Debate, recently sat down with InsideTheEagles to discuss his book. InsideThe Eagles: Glen, thanks for taking time to tell the readers of InsideTheEagles about your new book. ITE: What is the name of your new book and when does it hit the stands? 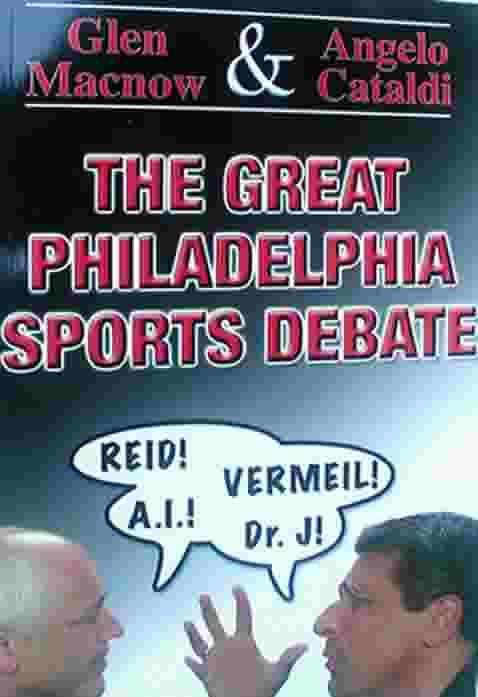 GM: The book is called The Great Sports Debate and it went on sale this past Monday. ITE: "The Great Sports Debate", where did you come up with that name? GM: Well, it's based on the old PRISM television show I used to do with Angelo Cataldi, Al Morganti, Jayson Stark and Mike Missanelli. This book is a written version of what we did on that show. ITE: Glen, you have such a busy schedule , when did you find time to write your new book? GM: Because I'm usually on the air at night, I managed to squeeze in a few hours every morning. Really, this book wrote itself. ITE: What inspired you to write this book? GM: Well, Angelo and I -- like most guys -- love to argue the big issues in sports. Who's the best QB? Who was the worst coach? What was the dumbest trade? So, we just decided to put into writing what we do all day anyway. ITE: After you wrote your first book, "The Great Philadelphia Fan Book", did you feel there was more that needed to be told about the city of Philadelphia and its sports? GM: Yes. This city, more than any other I've been to, follows sports with a passion. The first book, which I wrote with Anthony Gargano, was a defense of the great fans of this city. This one is a chance for Angelo and I to be fans, and debate the big topics. ITE: Can you give us some examples? GM: Sure. Who was better, Randall or Jaws? Who's more exciting, Iverson or Doc? Why did Eric Lindros fail? How about this one -- who's the enemy, the Cowboys or the Giants. Angelo, foolishly, chose the Giants. Can you believe that? ITE: Glen , the way you write and the things you write about, you obviously love Philadelphia. Why do you love Philadelphia so much? GM: I lived in a lot of cities before I landed here 20 years ago -- Buffalo, Boston, Fort Lauderdale and Detroit. When I moved here, and raised my kids here, I learned this was a city of hard-working, passionate, honest people. I was lucky to end up here, and I'm never leaving. ITE: What do you think of the Philly fans? GM: Best in the world. They live and die with every win and loss, but they never bail on their teams. They're tough, they're smart and they can't be fooled. And they lead the world in loyalty. Consider this -- the Eagles haven't won a championship in 44 years, but the excitement level right now is as high as it has ever been. ITE: What was your favorite chapter to write? And what made it fun to write? GM: Well, I guess the last one, which was, in fact, a tribute to the fans. It centers on the night before they imploded the Vet. I went down there and met about 300 fans. We toasted the building, the players, the moments. We sang and shed a few tears. Very special night for me. ITE: Can you tell us why the fans will enjoy reading this book? GM: Because it takes 60 of the arguments that they've probably had in their lives and gives them the opinions of two guys who follow this stuff every day. You don't have to agree with Angelo or me -- or either of us, really -- but I think you'll be provoked by what we say. ITE: How do you feel now that you are an Author of not one, but two books? ITE: Glen, have you given any thoughts to writing another book? ITE: Can you tell us anything about it? GM: Well, I do a weekly show during the summer called "The WIP Movie Club for Men." I've been thinking of turning that into a book, something of a look at the 200 all-time best guy movies. Beyond that, Angelo and I may eventually write Volume 2 of the Great Sports Debate. ITE: Glen, I want to thank you for taking the time out of your busy schedule to sit down and tell us about " The Great Sports Debate" . Is there anything you would like to add before we go? GM: Only that I enjoy your web site. And people who enjoy reading your site will certainly enjoy our book. This is an excellent book. I loved reading it. You can order The Great Sports Debate right now while you're excited about reading it. Don't wait ! Click on this link now and order. Yes, I want to order Glen's book.